As you may have seen from past blogs, I have a varied assortment of doggie toys, official and the unofficial ones … plants, bird feeders, furniture, etc. All have succumbed to my testing in the real world environment. The official ones run the gamut from stuffed lions, birds, hard chew bones with little nubs, plastic bones with tennis balls on the ends, and the list goes on. 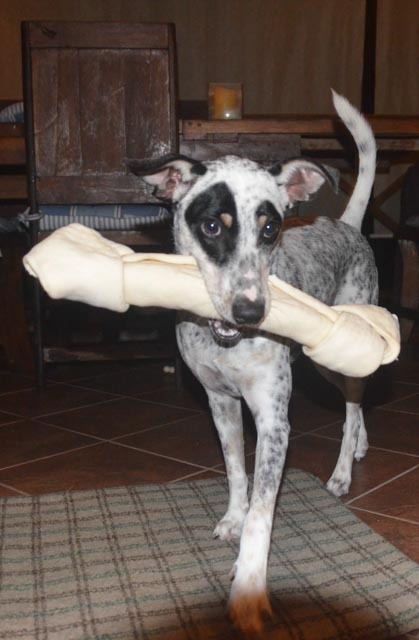 All have been, I can proudly say, chewed to bits and smithereens by yours truly, including T-Rex femurs. But one has defied all my efforts of chewing, shaking, throwing [by Mr. human during our games of fetch], getting soaked in the rain, you name it and he still comes back for more. 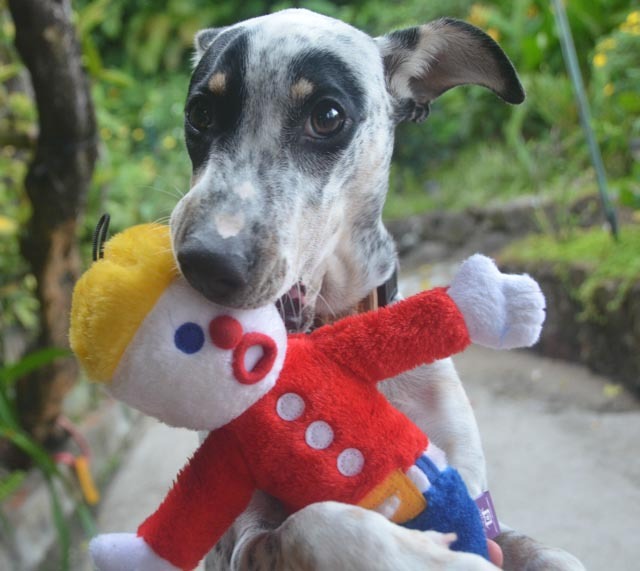 I am referring to none other than the irrepressible … Mr. Bill! Oh Noooooo! Mr. Bill. Everytime I bite on him, he taunts me with that voice of his. Oh Noooooo! Mr. Bill. I’ve been hearing that for months now. Drives me nuts. Still I don’t give up. I am Mr. Bill’s Sluggo. But he thwarts my Sluggo efforts each and every time. I’ve tried everything to rip him apart. But no luck. After persistent attempts I finally managed to set a slight tear at his waist, deliciously exposing his Mr. Bill stuffing. Finally, I had my opening! But alas, it was not to be. 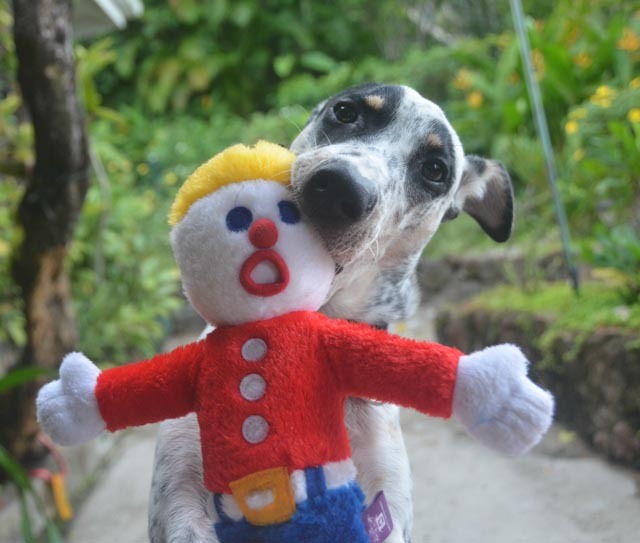 Mr. human spotted his inch long opening and rescued Mr. Bill from the clutches of my canines. Drats! Into the ER went Mr. Bill. He came out with a heavy duty set of stitches. It looked like the operation had been a bit bloody. But on closer inspection, it turned out to be Tabasco!!! Yuck. That stuff is nasty on the nose. And the situation wasn’t helped by Mr. human holding Mr. Bill in from of me right after the operation, squeezing him, taunting me … Oh Noooooo! Mr. Bill. Oh Noooooo! Mr. Bill. Oh Noooooo! Mr. Bill. No respect. I finally ran off to the country cabin for some peace and quiet. 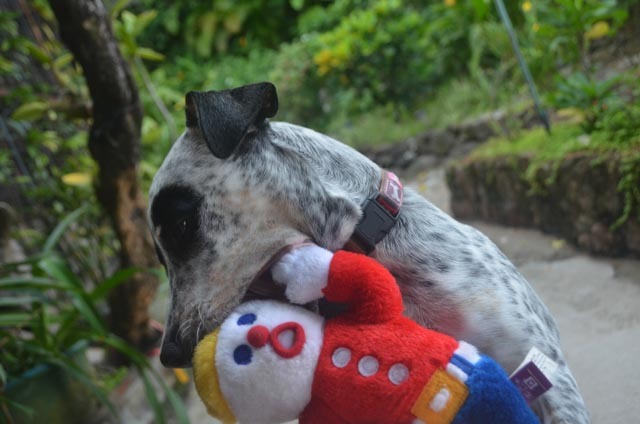 Still at night, sometimes I pop up, wide awake from a deep sleep , swearing I heard Mr. Bill …Oh Nooooo! It’s creepy. I purposely leave him out in the yard far away from me. So how does he manage to sneak onto the top of my crate in the dark? In the daylight, I still shake him, chew on him and get Mr. human to throw him. But Mr. Bill persists. He won’t go away. Especially at night … in the dark. Oh Noooooo! Mr. Bill. Hahahahaha. HAHAHA!! Pepper, you are growing so quickly!!! We have decided after seeing these pictures of how poor Mr. Bill is treated that it is a good thing Pepper will never be a mother.